The present activity The Physics of Floating Ball introduces us to the world of flying objects and the scientific principles behind them. Gigantic Aircrafts which lifts off the ground uses the same principles which are demonstrated in the present activity. The present activity emphasizes a fundamental understanding of fluid dynamics and the concept of lift force which is produced due to the difference in air pressure. The ball floats in the air because the fast-moving stream of air produced by the blower pushes the ball upwards balancing the weight of the ball (downward force of gravity). Hence, the ball floats in the air. But why doesn’t the ball move sideways away from the stream? It is also interesting to observe that the ball is pulled back into the air stream when we try to pull it out of the air stream. All these observations can hint us about the actual working principle behind the lift of an aircraft. 1. Turn on the air blower or the hair dryer and point it straight up. 2. Now carefully try to balance the ball above the air stream and once it is done, you can move your hand away from the stream. 3. We will observe that the ball moves in the air up and down for some time. Later the ball floats in the air in an equilibrium position just above the jet of air. 4. Try tilting the airstream to one side. We can observe that the ball floats in the air up to some angle before it falls down when we further tilt the flow. 5. Now perform the same experiment by moving the ball towards the wall. We can observe that the ball moves to a greater height when it is near the wall. 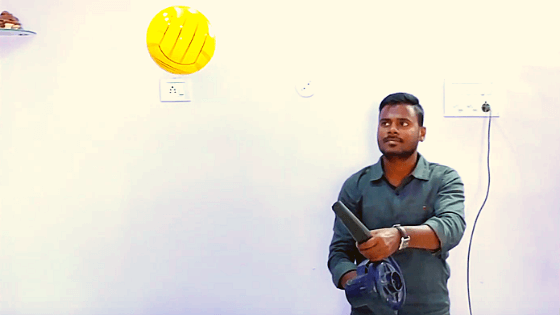 The ball floats in the air because the fast-moving stream of air produced by the blower pushes the ball upwards balancing the weight of the ball (downward force of gravity). Hence, the ball floats in the air. Further, the ball stays within the air stream without moving sideways because when the fast-moving air hits the ball, the air gets deflected towards the sides and must have moved away from the ball but Bernoulli’s principle states that fast-moving air creates low pressure. Since the ball is under the influence of a fast-moving stream of air, low pressure is developed around the ball which causes the deflected air to follow the curved surface of the ball instead of moving away from the ball. This also causes the ball to move towards the low-pressure area. This phenomenon of air to follow curved surfaces is called the Coandă effect. The Coandă effect named after Romanian aerodynamics pioneer Henri Coandă is the governing principle behind this demonstration. When the ball is pulled towards one side due to the Coandă effect, the other side develops low pressure due to rapid moving air which causes the ball to move the opposite side. Hence the ball continuous to move left and right until all the forces are balanced in every direction. Why does the ball move to a greater height when it is near the wall? When we go near the wall with the ball balanced on the air stream, the high pressure build-up below the surface of the ball further increases due to the presence of wall which obstructs the air to expand outward, thus forcing the ball to move to a greater height. 1. The Coandă effect has several important applications especially in the field of aeronautics. 2. The Coandă effect is used in the high lift devices in aircrafts. The high lift devices include wing flaps and slats which generate additional lift for the aircraft. 3. Several experimental aircrafts such as Avrocar are designed using the Coandă effect. 4. 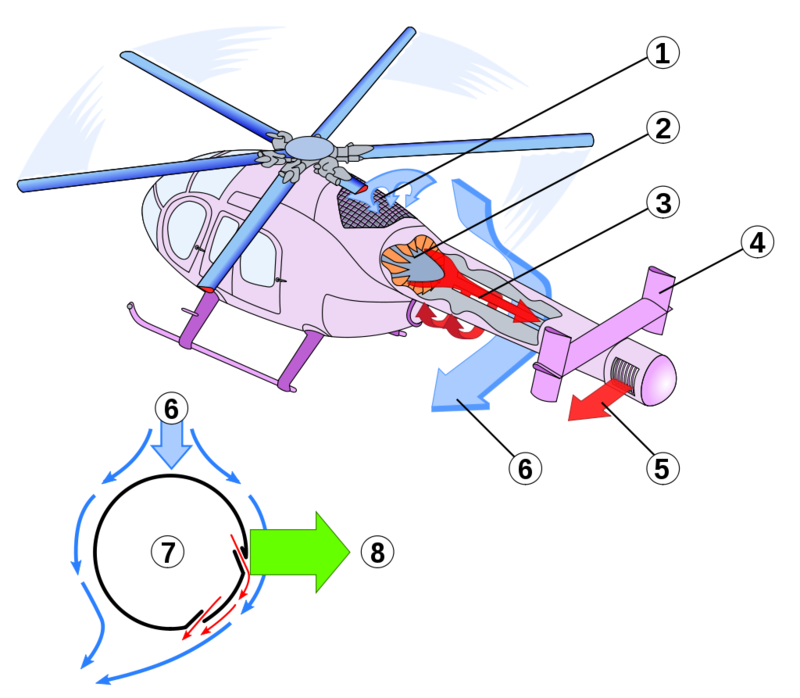 The NOTAR helicopter also called as no tail rotor uses the Coandă effect to replace the conventional tail Rotor. 5. STOL (short takeoff and landing) aircraft have also been developed using the Coandă effect. Practical demonstration of the floating Ping Pong ball is widely circulated all throughout the internet. Teachers and Educators all across the globe, demonstrate the working principle of aircraft using this experiment. The following experiment is extensively performed using a small Ping Pong Ball or sometimes even with an ordinary balloon. The fast-moving air stream which is required for the experiment is produced using a hairdryer. A Fluid (liquid or gas) flowing past the surface of a body exerts an upward force on it which is called as Lift. If the fluid is air, then it is called the aerodynamic lift. In liquids especially in water, the force exerted on the body is called as a hydrodynamic lift. Bernoulli’s principle establishes the relationship between the pressure and the velocity components of the fluid. It states that increases in speed of fluid occur simultaneously with the decrease in pressure in the fluid. In simple terms, it can be stated as pressure and velocity are inversely proportional, if the pressure increases the velocity decreases and vice versa. Fluid dynamics is the branch of Physics which deals with flow of fluids. Liquids and gases are considered as fluids.